Direct to consumer raw milk sales are strictly illegal in the state of Ohio and the Ohio Department of Agriculture has taken heavy-handed action against farmers selling raw milk. The ODA has sent under-cover operatives to farms, cajoled farmers into selling a gallon or two of milk and then taken legal action against them. In September 2005 an ODA operative convinced Amish farmer Arlie Stutzman to let him fill a gallon container from the bulk tank, pushed two dollars into his hand and left the farm. That December the ODA started administrative hearings against Stutzman that resulted in the loss of his Grade A dairy license, depriving his family of a means of making a living. In March of 2006 the ODA raided Kentucky farmer Gary Oaks as he was attempting to deliver milk to his Cincinnati-area shareholders, who collapsed and was hospitalized during the enforcement action. The ODA pursued similar administrative actions against Darke County dairy farmer Paul Schmitmeyer, revoking his dairy license for managing a herdshare. The lesson here is Don't Sell Raw Milk to Anyone! The Schmitmeyers and their shareholders filed suit against the ODA, and as the result of a December 2006 court decision (Carol Schmitmeyer vs. Ohio Department of Agriculture) and the election of Governor Strickland herdshare boarding agreements that comport with Ohio contract law are now legally recognized and the ODA paid compensating legal expenses. Herdshare boarding contracts are private agreements between individuals who collectively own the animals in a dairy herd and the farmer hired to manage that herd. 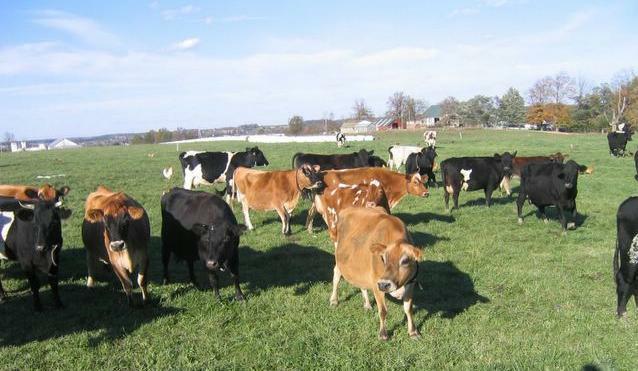 What that essentially means is that if you purchase a set number of shares in a dairy herd and sign a boarding contract to pay for the care and management of your portion of the herd you are then entitled to receive a corresponding amount of the herd's milk production, depending on seasonal availability. It may sound complicated but it runs pretty smoothly in practice and it is not difficult to buy into a herdshare. On the other hand, buying into a herdshare should not be done casually and requires an ongoing commitment to the herd, the farmer hired to manage the herd and the other shareholders. Herdshare contracts are not a smoke-and-mirrors trick to get around state laws - boarding contracts are technically called agistments, such arrangements are common in agricultural communities and are rooted in English common law. It is very typical for farmers to lease extra land for running cattle, or to set up contracts for others to manage their cattle. Additionally, shares can be sold in virtually any enterprise - companies, time-share condominiums, boats, etc. The very words "stock" and "stock market" come from the buying and selling of livestock - cattle, pigs, sheep, goats, etc. Buying shares in a dairy herd is no different from buying shares in anything else - those shares represent legal ownership and responsibility. It is your responsibility to pay your monthly boarding fee, and your responsibility to pick up your share of the herd's milk production. If you don't pick up your milk when it is available then you lose that distribution, but you still pay your monthly fee. You can buy or sell shares, and shares can even appreciate in value. The per-share price and monthly boarding fees are determined by the individual herd manager and can vary throughout the state depending on local conditions and competition. A typical per-share price for cow herdshares may be in the $40 to $60 range, and a typical boarding fee may be $20 to $30 per-share. (There are also goat herdshares available, and the per-share price may be a little less although the boarding fee will probably be similar.) The money paid to initially purchase your shares represents your investment in the herd and establishes your legal ownership. The monthly boarding fee covers the farmer's costs of managing and milking the animals for you. The herdshare contract also typically spells out the manager's responsibility for testing and maintaining sanitary conditions, but these are your animals and it is your right to inspect the farm yourself. Many people find that they develop a close bond with their farm family and bring their children to the farm to experience rural life. The ability to "shake the hand that feeds you" is a direct benefit of the herdshare contract, allowing you to know and see how your food is produced.